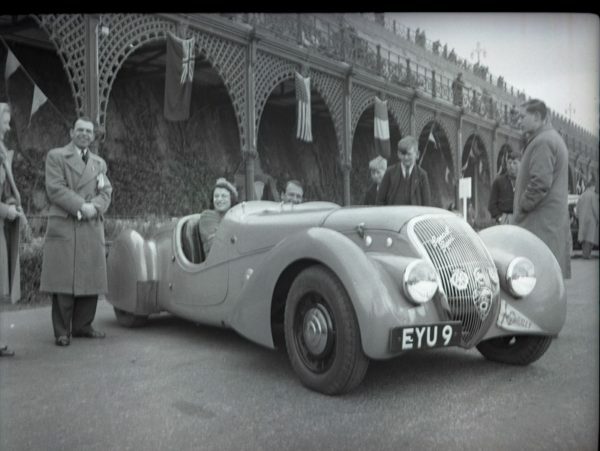 This snapshot of Dorothy Patten in a Peugeot 402 Darl’mat ‘Spécial Sport’ on Brighton’s Madeira Drive is a rare one. There is a famous picture of Miss Patten sitting on the door of this same car in May 1939, outside Tom Knowles’s garage in London, but as far as we know this is a completely new picture. The Darl’mat Special was named after Emile Darl’mat (1892–1970), the founder and owner of a Peugeot distributor with a car body business established in Rue de l’Université in Paris in 1923. At the end of 1933, Darl’mat introduced Georges Paulin to the Parisian coachbuilder Michel Pourtout. Paulin was by training a dentist, but had a passion for designing coachwork – and from that moment became the official designer for Pourtout. In 1937, three identical Darl’mat Peugeots, bodied by Pourtout, were entered for Le Mans. They were 302s with 402 engines (4 cylinders and 2 litres). That year they did well: 7th, 8th and 10th in the general classification, and in 1938 one of these cars, driven by Cortanze, achieved first place in the under-2 litre category. Encouraged by this success, Darl’mat and Pourtout produced a series of 106 Peugeot 402 Darl’Mat “Spécial Sport” models, of which Dorothy Patten’s is undoubtedly one example. Fortunately, this car still exists. It was found as a wreck in Sussex and is now in Holland. We are grateful to Peter Shrubsall and Allan Crouch, who unearthed the photo, and to Anders Clausager, who identified the car and its famous owner. Thanks for showing this photo. I believe it is my father Tom Knowles in the passenger seat. He prepared the car for the 1938 Brooklands Race. The car finished last.